We’ve Made Some Changes to Your Wealth Portfolio. Here’s What You Need to Know. At SoFi Invest, our mission is simple: We want to help you make the smartest investment decisions possible so that you can continue on the path to your goals. That’s why we constantly monitor the market, the economy, and your personal Invest portfolio. Each month we discuss the economy, update our forecasts based on what the market is doing, and every now and then tweak the allocations within our member portfolios. This is one of those times. Below, we’re sharing the updates we’ve made to all five risk strategies: Conservative, Moderately Conservative, Moderate, Moderately Aggressive, and Aggressive. When it comes to your investments, we always want to be transparent and keep you in the loop about adjustments that we’re making to help your money grow. Our lowest risk portfolio invests heavily in bonds, which may be appropriate for someone investing with a lower tolerance for risk or a shorter time horizon, like under three years. With bonds, there are three options: Short-term bonds are considered lower-risk/lower-reward, intermediate-term bonds are considered moderate-risk/moderate-reward, and long-term bonds are considered higher-risk/higher-reward. Please do keep in mind that all investing comes with the risk of loss. The Conservative strategy investments are tilted towards short-term bonds because they offer the lowest risk and often perform better when interest rates are rising (the environment we’re in currently). 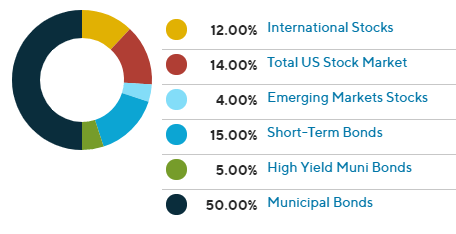 However, we’re currently reducing some of the short-term bonds in favor of some intermediate-term bonds. 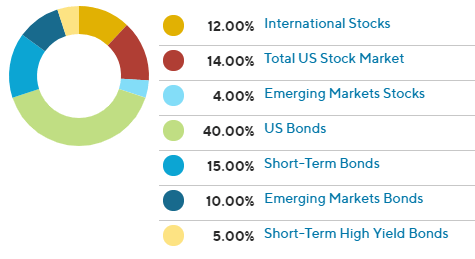 Overall, this is still a cautious approach, but we believe that these new allocations will better position the portfolio. 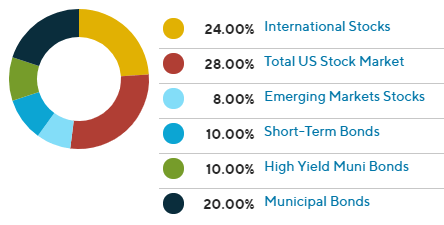 The Moderately Conservative strategy is also weighted toward short-term bonds, so it’s a fairly cautious approach. Historically, we’ve selected both investment-grade bonds (lower risk, lower interest rate) and high-yield bonds (higher risk, higher interest rate). Now, we’re reducing some of that high-yield exposure and increasing the amount of investment-grade bonds to lower the overall risk of this portfolio. This strategy also invests a bit in the stock market. Our approach here (and in other strategies) is to balance our investments across the globe. We’re putting a little less in Emerging Markets, less in U.S. Markets, and more in Developed Markets outside the U.S. (like Japan, parts of Europe, and Canada). We believe that these new allocations will give this portfolio a relatively better chance to grow. Similarly to the Moderately Conservative strategy, we’ve significantly reduced investments in high-yield bonds and increased the amount of investment-grade bonds. We’ve also added two new core bond ETFs. Overall, this approach gives a diversified approach to bonds and reduces the anticipated risk of this portfolio. In the stock market, we’re again balancing our approach: putting a little less in Emerging Markets, less in U.S. Markets, and more in Developed Markets outside the U.S. (like Japan, parts of Europe, and Canada). In the Moderately Aggressive strategy, we wanted to increase stock investments in Developed Markets outside of the United States (such as parts of Europe, Canada, and Japan). To do this, we reduced stock investments in Emerging Markets and U.S. Markets, as well as reduced investments in high-yield bonds in favor of core U.S. bonds. We believe this offers a more optimal risk/reward trade-off, based on the current market environment and the potential for rising interest rates. Over the past year and a half, we have seen solid performance in stock markets in U.S. and Emerging Markets. We upgraded our anticipated relative stock investment performance in Developed Markets outside the United States (such as parts of Europe, Canada, and Japan), so we’ve increased investments there. 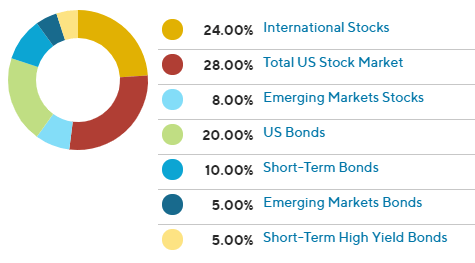 While U.S. markets still make up the largest portion of this portfolio, the current approach aims to balance out investments across the globe. Have questions about the strategy you’re investing in, and if it’s still the right one for you? As always, SoFi Invest advisors are always available to answer any questions you have. Schedule a complimentary financial check-in for personalized support to help you achieve your goals. The SoFi Wealth platform is operated and maintained by SoFi Wealth LLC, an SEC Registered Investment Advisor. Brokerage services are provided to clients of SoFi Wealth LLC by SoFi Securities LLC, an affiliated broker-dealer registered with the Securities and Exchange Commission and a member of FINRA / SIPC. Investments are not FDIC Insured, have No Guarantee and May Lose Value. Investing in securities involves risks, and there is always the potential of losing money when you invest in securities. Clearing and custody of all securities are provided by APEX Clearing Corporation.